Prices shown are for Unframed portraits and costings are the same whether you choose a head & shoulders study or Full body stance. There will be no extra charges for additional subjects on a portrait as these will be fitted within the same space as a single subject. If you are unsure of which size to choose, you can take a look at the 'SIZING' guide which gives you a visual idea as well as recommendations. If you know where you will be placing your completed portrait, this may place an important bearing on your selection. Please feel free to contact me if you need any further help or advice. If you wish to have a detailed background added to your portrait, you can provide me with an image you have yourself of a favourite place or I can create a few mock examples taken from a wide collection of my own images that you can then choose from. 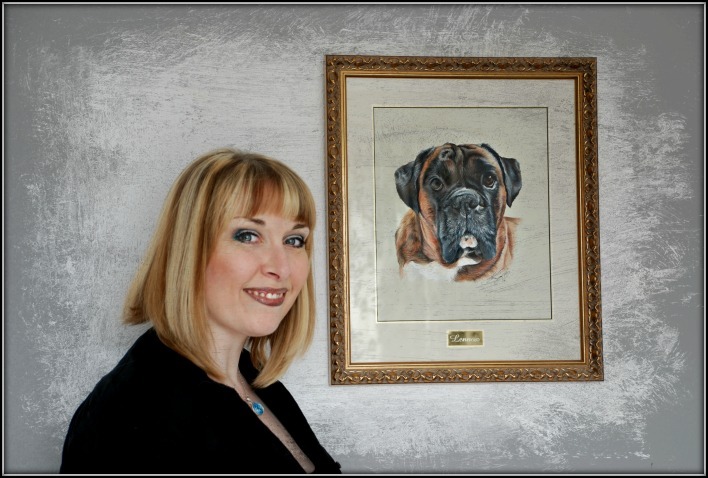 Tonal Backgrounds are included in the pricing structure for Acrylics but charged extra for Coloured pencil portraits. My pencil portraits are normally produced without a background, however you can opt for a tonal or detailed background added if you prefer for a small fee. Although the tonal background is the cheaper option, a detailed background can be more effective dependent on the subject matter. Each 'subject' painting comes with a standard tonal background which compliments the colours of the main subject(s) - however, you can also choose to have a detailed background/foreground added to the painting for a small charge. See pricing structure chart above. I accept Commissions from within the UK as well as Internationally and payments can be made via Cash in person if you live nearby, Cheque, Bank Transfer or card payments made through Paypal which accepts all major credit cards via Paypal's secure site. I can also offer an easy payment plan for those who would prefer to pay in installments each month. I offer FREE DELIVERY* on all Unframed orders within the UK, although framed portraits inclusive of glass will incur postal charges. Shipping costs outside the UK will be calculated upon completion of a portrait as size, weight & destination can vary considerably between zones - please feel free to ask for an estimate. 12" x 12" Acrylic painting framed in the BROCKWELL moulding. Framing is available for Acrylic paintings as they are treated with a varnish and so require no glass which is safer to transport. Framing costs are charged extra to the prices stipulated on this page and will depend on choice of frame and any other optional extras such as name plaques, mounts etc. See my FRAMING page for examples and prices. 10" x 12" pencil portrait framed, double mounted and added name plaque. Pencil Portraits are sold Unframed. Your pencil portrait needs to be framed under glass and there is always a possibility of damage in transit - as glass is not covered by Insurance under any postal service, I usually recommend you take it to a local framer. If you opt to collect your portrait from me direct and require framing, please get in touch so we can organise something.